LYING MUSLIM ARAB FABRICATES ATTACK BY ”EXTREMIST JEWS”……. – The Tundra Tabloids……. LYING MUSLIM ARAB FABRICATES ATTACK BY ”EXTREMIST JEWS”……. And the Jew hating media eat it up. Arab resident of Israeli city of Lod hospitalized after vicious assault, blames ‘Jewish extremists’ – but his story soon unravels. 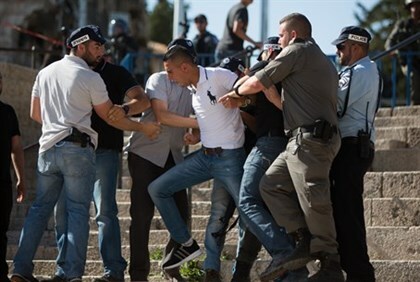 An Arab resident of Lod in central was caught fabricating an allegedattack by “Jewish extremists” Sunday morning, as tension remain high over the murder of a young Palestinian child in a terror attack Friday. The report quickly made the rounds in the Israeli and Palestinian media, along with pictures of a bloodied and battered Abu Sharikh. The claim that he had been the victim of a racist attack by Jews was particularly sensitive, coming just two days after the death of Ali Dawabsha in anattack believed to have been carried out by Jewish extremists Friday. Previous Post Previous Post OPEN BORDERS LEFTIST NUT JOBS COUNTERED BY EDL MEMBERS……. Next Post Next Post PIC OF THE WEEK FROM TROP…….